This report on the recent Australian experience with activation policies contains valuable lessons for other countries that need to improve the effectiveness of employment services and control benefit expenditure. It provides overview and assessment of labour market policies in Australia including the main institutions, benefit system, training programmes, employment incentives, and disability employment assistance.Australia is unique among OECD countries in that its mainstream employment services are all delivered by over 100 for-profit and non-profit providers competing in a “quasi-market”, with their operations financed by service fees, employment outcome payments, and a special fund for measures that tackle jobseekers’ barriers to employment. In most other OECD countries, these services are delivered by the Public Employment Service. 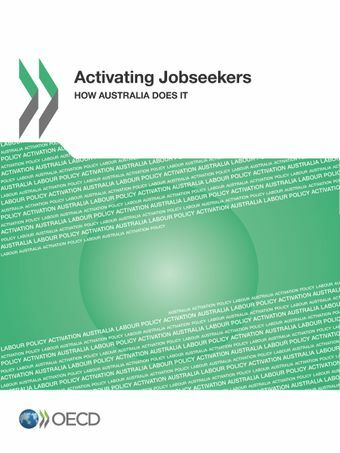 In the mid 2000s, several benefits previously paid without a job-search requirement were closed or reformed, bringing more people into the effective labour force.Australia now has one of the highest employment rates in the OECD and this report concludes that its activation system deserves some of the credit for this relatively good performance. The Job Services Australia model, introduced in 2009, reinforced the focus on employment outcomes for highly-disadvantaged groups. This report assesses the latest model for activation and puts forward some recommendations to improve its effectiveness.